If you dig deeper, the source of the above chart is Seth Daniels who wrote a very interesting article (pdf) back in April of 2014. Long story short, Seth argues that Canada is not exceptional when it comes to the real estate boom and bust cycle. It is a myth that strong financial oversight in Canada prevented the formation of a housing bubble in Canada. 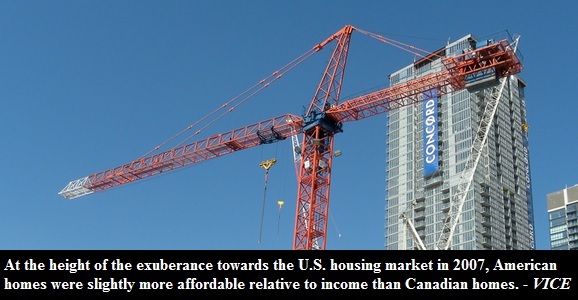 The current housing boom in Canada, and other countries around the world, is nothing else but a misallocation of capital. Specifically, it is a misallocation of borrowed capital. Everyone in the world uses the same monetary system, which is fractional reserve banking. The boom and bust cycle results because of artificial expansion of debt in the financial system that exceeds the underlying savings. "When the supply of credit is artificially expanded, entrepreneurs and consumers receive false signals about the state of the economy and make unsustainable decisions: a “clustering of errors” (or “malinvestments”). Imagine that the “true” market rate of interest is 10% based on the supply/demand of savings (“loanable funds”), but the Fed artificially fixes the rate at 1%: nearly every DCF/NPV calculation would now appear profitable." With artificial interest rates, the result is a borrowing boom. No wonder our debt levels keep climbing up as the housing boom continues. What makes things even worse in Canada is that the Canadian Mortgage and Housing Corporation (CMHC) added fuel the credit bonfire. Seth argues that the true risk lies not in the ~$560 billion on CMHC's books, but the amount to which the existence of CMHC distorted the structure of the Canadian economy. Since CMHC insures the riskiest borrowers in country, they are technically the safest borrowers to the Canadian banks because no matter what, the taxpayer guarantees the profit to the bank. Without CMHC, borrowers with low down payments would not be getting the mortgage rates they get now. "During the recession, increased unemployment, falling house prices, rising loan losses, systemic bankruptcies, and liquidations of unsuccessful investment projects will reveal the errors committed during the artificial boom. This will in turn reveal the latent insolvency of CMHC and greatly increase the odds of a financial accident."